Alabama is taking it's case to the US Supreme Court, after an appeal to overturn a lower court's decision to continue to allow Georgia to use Lake Lanier for water supply was rejected. Alabama and Florida, which depend on Lake Lanier water for water supply, claim that Georgia was never allowed to use the lake for water supply purposes. In June, a lower court maintained that Georgia had rights to the water. Florida and Alabama appealed to the 11th Circuit, who recently rejected the appeal. 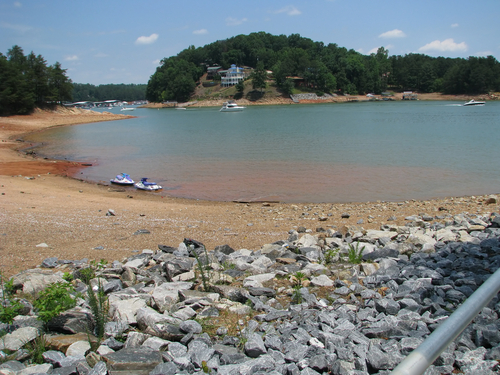 In a press release announcing the decision to appeal to the Supreme Court, Alabama Governor Robert Bentley said, "Allowing Atlanta to tap water from Lake Lanier significantly limits the flow of water downstream to Alabama." Despite this win, Georgians still feel they are losing this water war. Water releases from the lake by the USGS, who operate the federal reservoir, for the purpose of ensuring downstream environmental flows required by the Endangered Species Act, along with continued water demand from Georgia and a dearth of rainfall, conspire to rapidly deplete the lake. Lake levels are dropping an average of one foot per week. Georgia, concerned about their water supply, has asked USGS to reduce releases, to no avail. The crux of the issue is whether or not Atlanta has the right to use the lake for water supply. In 2009, the US District Court found that the city did not, in fact, have the right to use the water. The court ordered the three states to develop a water sharing agreement within three years. Subsequently, a three panel court overturned the district court's finding, stating that Atlanta could use the water. Alabama and Florida then appealed to the 11th Circuit, who refused to hear the case. Now, Alabama and Florida, which firmly believe Georgia has no rights to the water, will take the case to the US Supreme Court. Atlanta residents and businesses are keeping a close eye on this case. The city stands to lose its primary water source, which currently serves about 3 million customers in northern Georgia. This would be a devastating loss.